The White House is a beautifully presented 17th century property steeped in history and situated right on the seafront in the village of Anstruther, with magniﬁcent sea views over the Firth of Forth and the village from almost every window in the house. The property has tremendous character and many interesting features, including Adam ﬁreplaces, original panelled walls, secret cupboards from the smuggling days and a priest hole. It has also been converted into a very comfortable family home. On the lower level is a self contained ﬂat with separate access and also a connecting door to the utility area of the main house. The accommodation includes bedroom, shower room and sitting room with kitchen area. Anstruther is one of the highly acclaimed east Neuk villages in Fife. 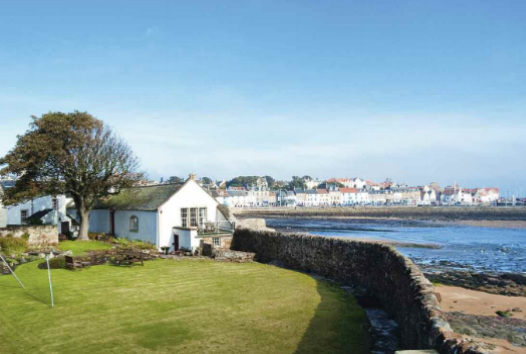 The East Neuk is best known for its ﬁshing villages built around picturesque harbours and sandy unspoilt beaches. St Andrews is only nine miles away. The guide price is £695,000. Please contact Knight Frank on 0131 222 9600 or visit www.knightfrank.co.uk.